Je veux bien qu'on n'entende plus rien, mais on parle, on crie: pourquoi ai-je peur d'entendre aussi ma propre voix? Et je ne parle pas de peur, mais de terreur, d'horreur. Qu'on me fasse taire (si l'on ose)! Qu'on couse mes lèvres comme celles d'une plaie! 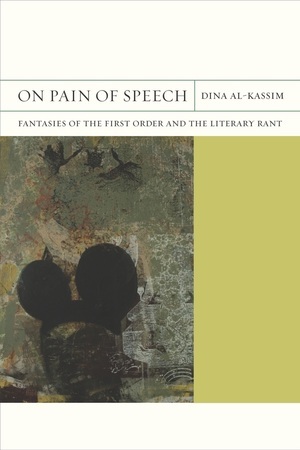 On Pain of Speech tracks the literary rant, an expression of provocation and resistance that imagines the power to speak in its own name where no such right is granted. Focusing on the “politics of address,” Dina Al-Kassim views the rant through the lens of Michel Foucault's notion of the biopolitical subject and finds that its abject address is an essential yet overlooked feature of modernism. Deftly approaching disparate fields—decadent modernism, queer studies, subjection, critical psychoanalysis, and postcolonial avant-garde—and encompassing both Euro-American and Francophone Arabic modernisms, she offers an ambitious theoretical perspective on the ongoing redefinition of modernism. She includes readings of Jane Bowles, Abdelwahab Meddeb, and Oscar Wilde, and invokes a wide range of ideas, including those of Theodor Adorno, Sigmund Freud, Jacques Lacan, Judith Butler, Jean Laplanche, and Eve Kosofsky Sedgwick. Dina Al-Kassim is Associate Professor of Comparative Literature at the University of California, Irvine.